The Boutique pulldown kitchen faucet offers added functionality with three spray options: aerated stream, spray and pause. Moen's patented pause button allows users to interrupt the water flow while moving the spout outside of the sink, making it ideal for watering plants and filling large pots. To meet design needs, the spout features a clean, simple design with gracefully curved surfaces that complement almost any decor. Unique decorative touches and intricate design details give the Coretta pulldown kitchen faucet a sophisticated feel. The faucet features Moen's Power Boost technology, which provides a faster clean and a faster fill with the push of a button. Coretta also offers a matching soap dispenser for fully coordinated convenience. Brantford Single-Handle Pull-Out Sprayer Kitchen Faucet With Reflex And Power Clean In Chrome Brantford kitchen and bar/prep faucets make a traditionally styled space feel truly finished. The spout enhances the curvature of the faucet body and handle for a beautiful, polished look. Brantford Single-Handle Pull-Out Sprayer Kitchen Faucet With Reflex And Power Clean In Chrome is rated 4.7 out of 5 by 9. Rated 5 out of 5 by Audi from love this faucet. Works very well. Operates smoothly and... love this faucet. Works very well. Operates smoothly and looks good. Very easy to install. Rated 5 out of 5 by Richard from Well designed and easy to install.... Well designed and easy to install. 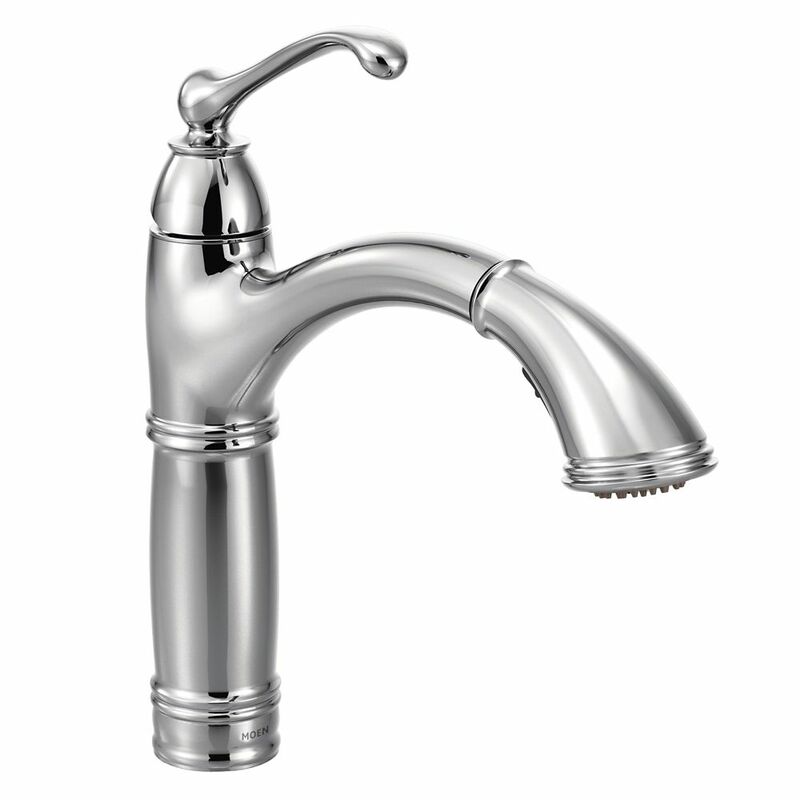 Rated 4 out of 5 by Beth from This faucet is a wonderful addition to my new kitchen!... This faucet is a wonderful addition to my new kitchen! I love everything about it and it was really easy to install. The sprayer is really useful as well. I purchased this faucet not only on the design, but also the reviews and it's proven to be a good decision. That said, I ended up ordering a second one because the first one was defective. I was really surprised that such respected company as Moen would let a quality issue slide by. The flex hose was broken and scraped away on one area and looked like something had burned away.or scraped it away. But I ordered another one and it was fine and just returned the original faucet to home depot. No problem. So, in the end all worked out fine. Rated 5 out of 5 by Peveka from Awesome faucet!... Awesome faucet! Rated 5 out of 5 by Dina from Beautiful faucet that feels high end. I love this. It's beautiful. I like the pull out sprayer.... Beautiful faucet that feels high end. I love this. It's beautiful. I like the pull out sprayer. And I personally like the handle on top because I can push it on and off with my wrist when my hands are dirty. Also it really resists spots and fingerprints.